Fulton County Animal Services (FCAS) is overwhelmed with a tremendous amount of homeless pets. Because we do not want to euthanize your pet or euthanize another pet to make space for your pet, surrendering your pet to us should only be done as a last resort. Owner surrenders are accepted at Fulton County Animal Services on an appointment-only basis and there is a $35 surrender fee per animal. We ask that you read the tips below and try to find another solution before considering surrendering an animal to us. FCAS does not provide owner requested euthanasia as a service. Owners needing to euthanize sick, elderly, injured, etc. animals nust take them to a licensed veterinarian to have them euthanized. Check with your own private veterinarian or non-profit clinics such as Dearborn Animal Hospital, Wellpet Humane, or the Atlanta Humane Society for their current prices and policies regarding euthanasia. Please note that Wellpet Humane gives discounted rates for parvo treatment in puppies. First consider privately finding a new home for your pet through friends, family, or other resources. There are many options and resources available to help you keep your pet, including those listed below. If the cost of spaying or neutering your pet is outside of your budget, LifeLine Animal Project offers affordable spay/neuter surgeries, four days a week, at two low-cost LifeLine Spay & Neuter Clinics in Avondale Estates and College Park. Our clinics also provide low-cost vaccinations at clinic events held monthly. Daffy's Pet Soup Kitchen provides free pet food. Save Our Pets Food Bank delivers food to your home monthly for up to four dogs and five cats. $10/month covers transport fees. Pet Buddies Food Pantry provides free food and pet supplies on a temporary basis. WellPet Humane provides veterinary services for those struggling financially. Pals Atlanta provides pet care, including free food and basic veterinary care, to the companion pets of critically-ill and disabled Atlantans. Community Veterinary Care helps those who cannot help their sick or injured pets due to financial hardship. The Pet Fund provides funding for non-basic, non-urgent care, such as cancer treatment, heart disease, chronic conditions, endocrine diseases, eye diseases, etc. Care Credit is a credit card company for health care, including veterinary care. LifeLine Spay & Neuter Clinics offer vaccine clinics once a month and low-cost spay and neuter procedures. PetRelocation.com and AirAnimal.com offer information and services help move pets abroad. DogsOnDeployment.org helps people being deployed find temporary homes for their dogs while they are away. See an allergist to determine if you have specific pet allergies. Children may outgrow pet allergies, and many others successfully manage their symptoms and keep their pet in their home. Children with pets are less likely to develop pet allergies. Create a pet-free area in your home to go to when symptoms act up. Vacuum and clean floors and furniture on a weekly basis. Place a high efficiency particulate air purifier (HEPA) in the home. Wash hands, pets, clothing, and bedding materials frequently, including the pet’s bed. Often pet behavior issues can be managed through training. If your dog has pent-up energy, he or she may need more exercise, especially if he or she is crated while you are at work. Make sure that your dog gets walked or played with for at least an hour a day. Frogs to Dogs offers a free consultation for dogs adopted from LifeLine’s shelters. Paws Whiskers & Claws offers behavioral assessments for cats. Positively, the website of LifeLine supporter and world-renowned trainer, Victoria Stilwell, offers training tips for nearly every pet behavior issue. Jabula Dog Academy is another great resource for training in Decatur, GA.
We understand that family changes, like having a new baby, can be overwhelming. However, we believe that pets can also teach children empathy and compassion, as well as lower kids’ stress levels. Many studies show that children who live with pets exercise more, have higher self-esteem, and have fewer respiratory infections than their pet-free peers. Make sure that all the pets in your home are spayed or neutered. Pets who have not been fixed may not get along well with spayed/neutered pets. Most pets, children, and spouses require an adjustment period that varies with every situation and can take several weeks or months. If necessary, keep the pet separated, until he feels more comfortable in your home. There are some great resources on the internet, even on PetMD.com, for introducing new animals into your home. LifeLine also has a flyer on introducing a new dog to your pack. The ASPCA has information on preparing your dog for a new baby and other topics relating to pets and babies. If none of the above suggestions helps, please try to re-home your pet. Give yourself time to re-home your pet; it can often take weeks to months. 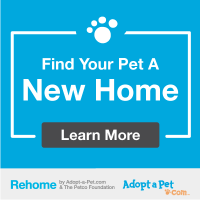 The more people who know your pet needs a new home, the more likely you will find the right home. Tell your friends, family, and co-workers, and ask them to do the same. Set up an online profile through the Petco Foundation and Adopt-a-Pet. Post your pet’s picture and information on social media or to online neighborhood groups, and ask everyone to share, but be sure to screen potential adopters to make sure that your dog is going to a great and loving home. Please have your pet spayed/neutered before re-homing it. This will make your pet more adoptable and keep the pet from contributing to Atlanta’s pet overpopulation problem. Check out these re-homing resources from Best Friends Animal Society. If your pet was originally adopted from a county shelter or rescue group, please contact them to see if they are willing to take your pet back. (Note: Some rescue groups contractually require you to return the pet to them if you can no longer keep it). Bring your pet to a rescue group facility, such as Atlanta Humane Society and PAWS Atlanta. Georgia SPOT Society has a list of rescue groups within the Atlanta area. Many of these organizations are composed of volunteers with limited resources. Offering a monetary donation to help cover food, shelter, and especially medical expenses will go a long way toward helping your pet get the resources it needs. Please be patient when waiting for a return call; it may take a few days. Feel free to call us at 404.613.0358 for referrals to resources that might help you if you are experiencing behavioral problems with your pet, if you can't afford pet food or a dog house, if your pet has fleas you can't afford to treat, if you can't afford vet care, etc. If you live in Fulton County and have exhausted all of the options above, please fill out the Owner Surrender Appointment Request Form. Please note, you must have an appointment before bringing in your pet. Have any feedback? Let us know here. Copyright © 2013 LifeLine Animal Project Inc. All rights reserved.